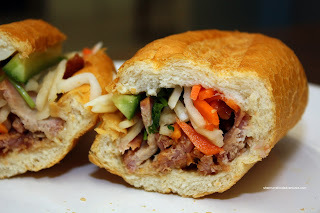 If you have been reading this blog lately, you will notice that I've been eating quite a few Banh Mi. 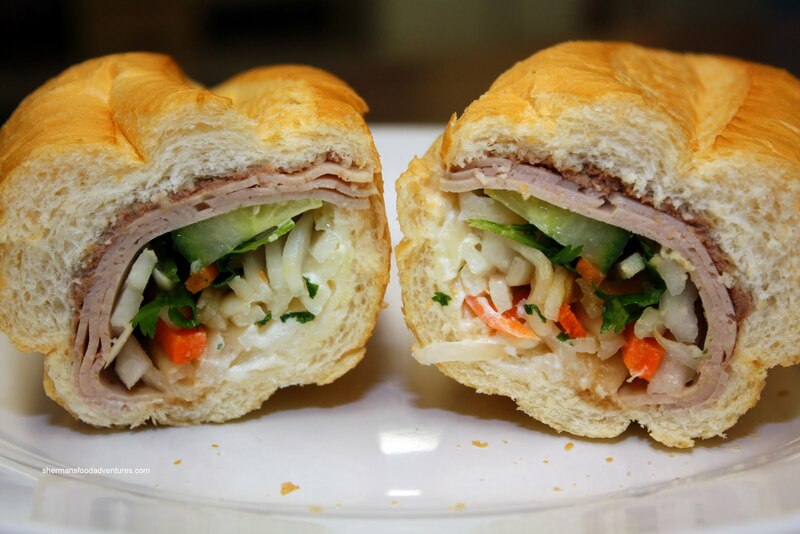 Hey, I absolutely love the Vietnamese sandwich. 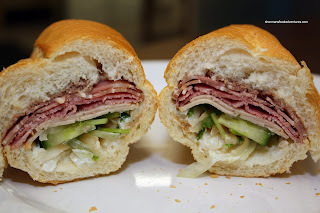 The combination of a French roll with possible ingredients such as pate, Vietnamese ham, Vietnamese headcheese, cucumbers, pickled daikon/carrots, butter-mayo, fish sauce, cilantro, green onion and hot peppers really work together. Moving away from the classic Banh Mi, we also have variations which include meatball, roast pork, satay meat and chicken. Now, there are many places to get this sandwich all over Vancouver. Not a difficult thing to find really. However, as we go further into the burbs, not only is it more elusive, it can be downright nasty. So far in Surrey, I've tried a few; but have yet to be impressed. 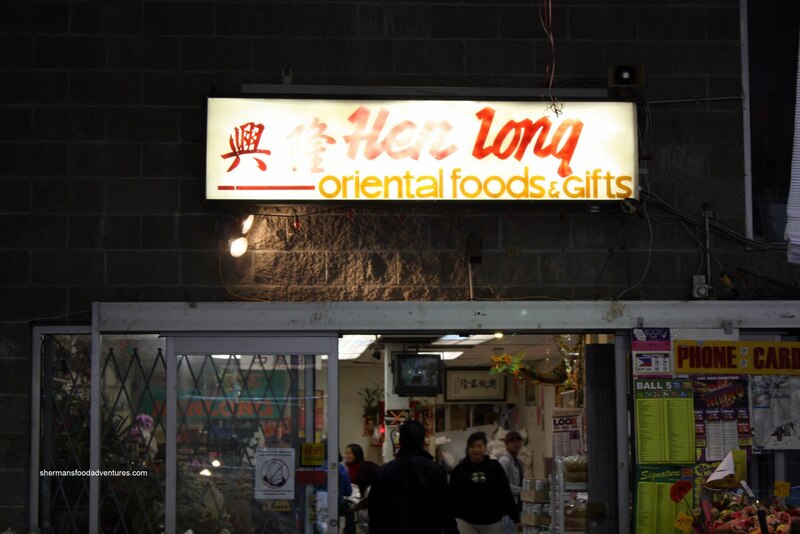 Next up is Hen Long Market. I have known about it for quite some time; however, it is not exactly a convenient place for me to visit. Screw it, I'll just make time to go, even if it meant using all my lunch hour just to pick it up. Now Hen Long is actually an Asian market kicking it ol' school if compared to T & T. They re in the process of building a new modern market next door. So stay tuned... For now, you got your dry goods, meat, bakery, BBQ and Banh Mi counter. 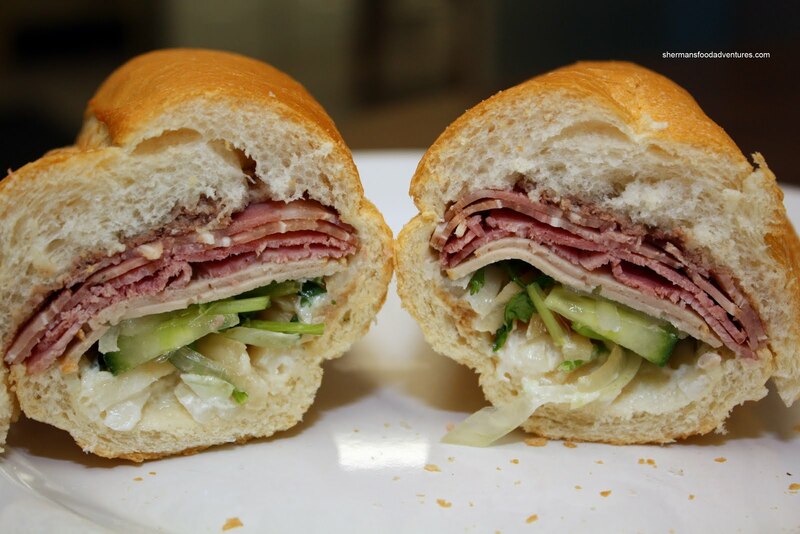 There are only 5 different subs to choose from including the classic Special (or cold cut). Consisting of pate, Vietnamese ham and headcheese, pickled daikon/carrots, cilantro, green onion and butter mayo, this is as good of a Banh Mi that I've had. Very similar to Ba Le before they started baking their own bread. The bread here is crispy on the outside and soft/airy on the inside. I also got the Vietnamese Ham and it was basically the same with just ham and no other meat. This was the cheapest at $3.00. For curiosity sake, I got the BBQ Pork as well. And it was basically a Banh Mi with Chinese BBQ pork. Although it was an okay sandwich, I personally didn't prefer it. Something about BBQ pork and Banh Mi don't mix. The pork was very sweet and savoury and it did not work with the rest of the ingredients, essentially overwhelming everything. Lastly, I got a Roast Pork. If you guessed Chinese roast pork, you are right. Actually, I liked this sandwich. Imagine fatty roast pork with pieces of cracklings strewn throughout combined with the usual condiments. I guess they can be considered a Vietnamese- Chinese version of the porcetta? Well, for $3.50, that's a pretty good deal on a fairly filling sandwich. Good. 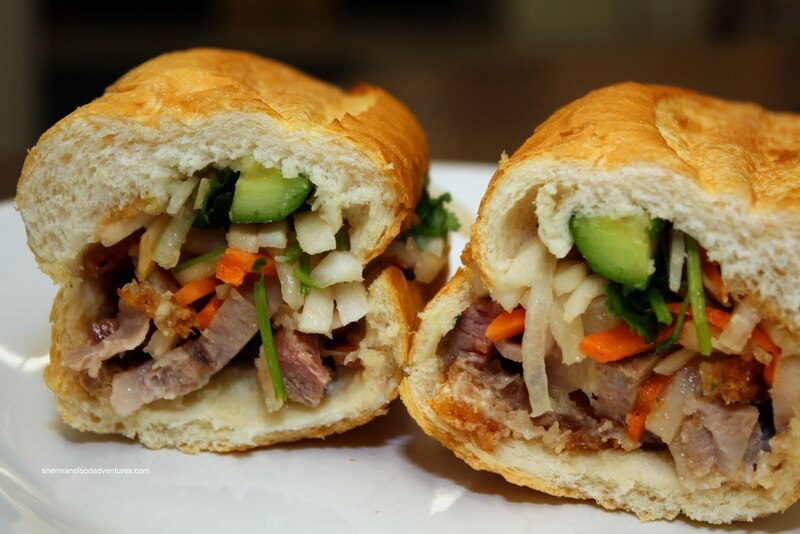 In fact, really good Banh Mi. It's not only good for Surrey, it's good for all of the GVRD. Definitely gives Ba Le and Tung Hing a run for its money. Prices are pretty standard compared to other places. Not really encouraging people to make the trek out here for it necessarily; but if you live nearby or are in the neighbourhood, it's definitely worth checking out. This is probably the only place my family gets Banh mis from (because of the location). For probably a good 15 years we've been getting sandwiches here. The prices have gone up considerably throughout the years, like all places though. I think it started at $1.50 or $1.75. Yah, the parking is tight now, there used to be tons of parking before they started building. Thanks for letting me know what it is. Dee, thanks for the tip about this place!